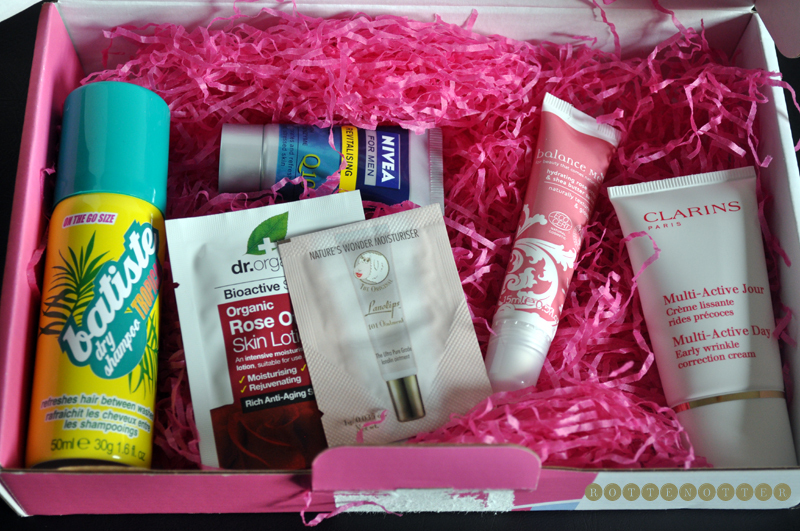 I used to get the Latest In Beauty boxes before they expanded and offered different varieties. It was when the boxes were paid for using your phone credit and you got 3 samples. They still do the £1 monthly boxes but now offer themed boxes and luxury samples. I ordered two of the themed boxes, both have been out a while but are new to me. What I really like about LIB is that you can see what is in the boxes before you buy them and that you only pay for the one box. You don't have to worry about cancelling your subscription before next months money is taken out of your account. These took about 2 days to arrive which is great as delivery is free. Although they don't fit through our letter box unlike the £1 boxes so someone has to be in. 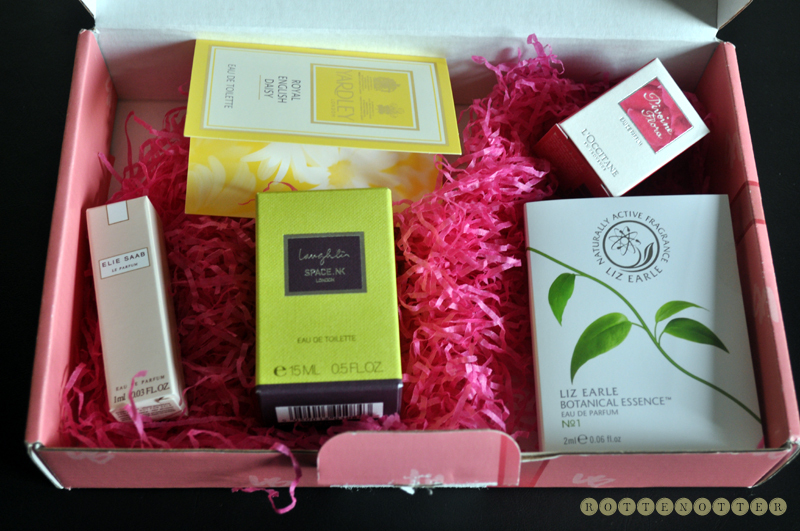 CEW UK 2011 Beauty Insiders Choice Winners Box - This box contains several products from the 2011 CEW Awards and costs £4.95. Batiste Tropical Dry Shampoo - My favourite dry shampoo brand and I love having the mini sizes to take on holiday with me or if I'm staying at a friends house. I normally go for the original scent so this is a nice change. Nivea For Men Revitalizing Gel - Not going to get much use out of this one so will be getting passed onto my dad or a friend. I think they should have included a different product instead of this one as I can't see too many men ordering the box. Dr.Organic Rose Otto Skin Lotion - Hoping this smells just as nice as the Balance Me product does! Rose has to be one of my favourite skin care scents, although it has to be right. Some rose scented products are horrible! Lanolips 101 Ointment - I have the full sized version of this already and love it. Going to be keeping this one in my handbag I think. Balance Me Rose Otto & Shea Butter Salve - I haven't tried any products from Balance Me before but I really like this salve. As I mentioned before, it smells heavenly. This is a full sized product and normally costs £8 so that covers the cost of the box and then some. Can see this making an appearance in my December favourites. Clarins Multi-active Day Early Wrinkle Correction Cream - Clarins is another brand I haven't tried before. I'm not a fan of the scent of this cream though so think this might get passed onto someone else. The Fragrance Discovery Box - I'm a big perfume lover, I can't leave the house without spray some and love how they look in my bookcase. I also love trying new scents and finding favourites. I always carry a perfume in my bag too so little samples are perfect. Elie Saab - This perfume is described as sun-kissed, radiant orange blossom, jasmine absolute, patchouli, cedar woody accord and honey. This is a little 1ml sample and I think I'm going to have to buy this at some point. It smells so nice! Yardley London Daisy - This perfume is described as an elegant dewy fresh, green leaves and apple combined with hyacinth and white rose with a base of sandalwood and musk. I've tried quite a few fragrances from Yardley and they're all true to their descriptions. This one is really fresh and would make the perfect spring perfume. Space NK Laughter - This perfume is described as sun drenched orange groves, bergamot, grapefruit and lime, juniper berry, rosemary, amber and ginger. It's more of a unisex scent so wont be for everyone but I love it. This will be going in my handbag and I'll probably add a bottle onto my forever growing wish list. This 15ml bottle is worth £20 which makes this box an absolute bargain. L'Occitane Pivoine Flora - This perfume is described as peony and magnolia in a floral accord with a woody trail. Peonies are my favourite flower and this bottle is just so cute! It's a 5ml bottle which is a great sample size. I just wish it had a spray as I find open perfumes so hard to use. I don't think I'd buy a bottle but I could change my mind once I've used it a few more times. Liz Earle - This perfume is described as bergamot, geranium, lavender, tonka bean, patchouli, mandarin and cedar wood. 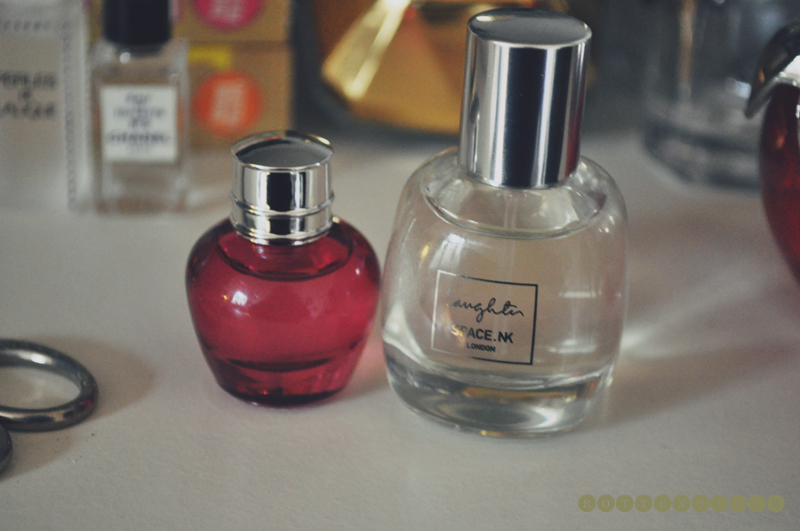 This is one of my favourite perfumes and I've already gone through a whole bottle! Glad to have this but this 2ml sample wont last long.